Add red and white to your home or cottage and celebrate this summer. A must see transformation from Victorian to beach house. The history behind Cuneo Interiors and a peek inside their expanded showroom. Four kitchens on display in support of the Hanover & District Hospital Foundation. Local businesses talk Canadian travel and plans to celebrate Canada’s 150th. 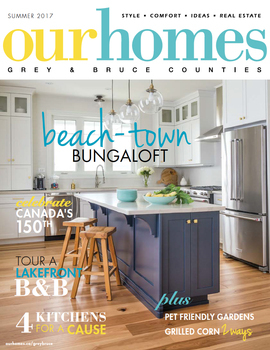 A young couple build a bungaloft inspired by the sand and the surf.